Okay, everyone. Lissen up. 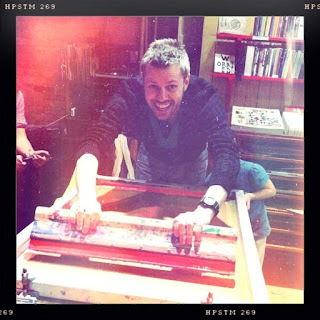 We all know Tom Devlin (creative director at Drawn & Quarterly, and the former publisher of Highwater Books) is awesome. Not only is he an awesome coworker, he is also a Hilarious Dude. But most importantly right now, did you know he is an awe-inspiring resource on comics? Tom has a loooong history of personal involvement in the alternative comics industry and an even longer-standing passion for the comics medium. 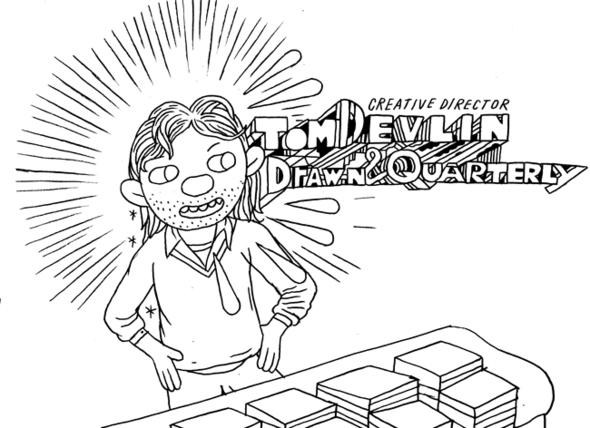 The very same Tom Devlin will be teaching a graphic novel course here at the Librairie in February 2012!! Specifically, from 6:30 to 9:30 on Tuesdays February 7th, 14th, 21st, and 28th. I've had a chance to peep at the syllabus for the class and it left me awfully excited! I think this would make the **ULTIMATE** Christmas gift for the comics nerd/cartoonist/awesome person/person-who-shops-too-much-at-the-Librairie-for-you-to-know-what-to-buy-them in your life. Tom as drawn by Ron Rege, Jr. This is an intensive 4-week graphic novel course which will be taught at the Librairie Drawn & Quarterly. The course will provide an overview of graphic novel history, an explanation of the tools of the trade, techniques in storytelling and cartooning, and, finally, the proper way to approach a comics publisher with your graphic novel. The workshop costs $200 for the whole session - this fee covers all supplies needed. Workshop participants obtain a 20% discount on all books at the store for the duration of the workshop. And then, to make things even more exciting, we are also pleased to announce an upcoming session of our long-running silkscreening workshop with the delightful Leyla Majeri. This would also make an amazing gift for the aspiring artist in your life. This 3-week course with instructor Leyla Majeri will go over the basics of silk screening from start to finish. Participants (ages 15 and up) will go home with a completed project. The workshop costs $100 for the whole session - this fee covers all supplies needed. Workshop participants obtain a 20% discount on all books at the store for the duration of the workshop. Come reserve your spot at the store with a deposit of $65 as soon as you can!